Materials: Harris Tweed, metal buckles, Orb Label, Orb Swing tag, HWR leather Label, Purple velvet ribbon, polypropylene webbing, Nickel strap keeper, Nickel D rings, Nickel strap adjuster, Acetal plastic buckles, designer label, Scottish Tweed. 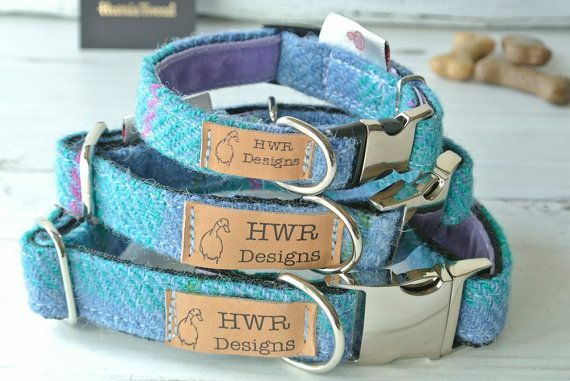 Designer Dog collars in smart turquoise, jade and cerise pink check Tweed from the historic Harris Tweed Mills. Available in three sizes. 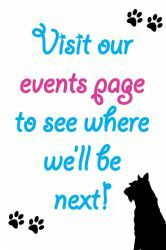 See below for matching leads and gift packaging for that perfect gift for the dog lover. The medium and small collars have quality metal fittings including a stylish nickel side release buckle fastening and extra strong welded 'D' ring and adjusting slider and the Lightweight Toy breed has a combination nickel and plastic buckle, plastic adjuster to reduce the weight for the smaller furbaby. Each collar carries the distinctive Harris Tweed 'Orb' label, (your guarantee of genuine Harris Tweed cloth.) and my leather label confirming an original HWR Design product. 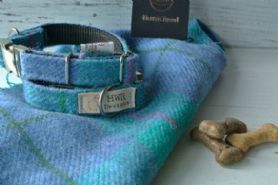 An authentic Harris Tweed Swing tag is included. 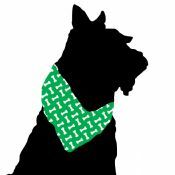 Medium Collars are 1" (25 mm) wide and are adjustable from 14 ½ " to 21 ½" ( 37 cm to 55 cm). Lightweight Toy Collars are 5/8" (15 mm) wide and are adjustable from approximately 7 ¾" to 11½" (20 cm to 29 cm). Please choose your preferred size from the drop down box. © Copyright 2017 Wellybix All rights reserved.